As hinted at in entry for 23rd September, I’m planning some new analysis of the 1990s UK mistletoe survey data this winter. This will need some help from volunteers – to ‘ground-truth’ some of the more questionable records over the winter period (when mistletoe is easy to spot as the leaves are off the host trees). No hurry yet – I need to work out what needs to be checked first – realistically I won’t be able to say what needs to be done until January onwards. But offers of help are always welcome (you’ll need to be able to correctly identify trees in winter though!). Full details available in BSBI News 106. For those who aren’t members of the BSBI I’m posting a pdf of the BSBI News request here. Mistletoe adds value, but how much??? Spent a very stimulating day talking about orchards on Thursday (27th) – at a workshop organised by Glasu at a country house (Penpont) near Brecon. 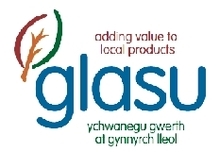 Glasu, for those who don’t know them, are an organisation piloting ‘innovative approaches to rural development to help develop more sustainable communities in rural Wales’. Thursday’s do was part of their New Harvest Project – which helps to adds value to local food produced in Powys – through innovative marketing, crops etc. Other elements of the day included presentations on apple juicing business, cropsharing your orchard crop, marketing local fruit to school tuck shops etc, canning orchard fruit at home, cider and perry making in Wales, local fruit for food co-ops and the results of a survey of Powys Orchards (this last was presented by the ‘Orchard Doctors’). All extremely good stuff, and very applely presented. I’m getting a lot of media enquiries about mistletoe already, from monthlies and a few TV shows – mostly a mix of questions about mistletoe conservation and about the mistletoe trade and festival in Tenbury Wells. This winter marks the 10th anniversary of completion of the survey and to mark the occasion some of the data are being re-assessed this autumn, with additional data gathering planned for January – with a little help from some volunteers (so far un-recruited but more on that soon). And there are renewed efforts to quantify the economic value mistletoe can bring to an apple orchard – too much can be a pest, but managed amounts can conserve the plant, maintain tradition and bring in an income. Getting firm figures is difficult – but there’s a lot of interest from orchard conservation groups – who can see how mistletoe can add to the value of traditional orchards – and be used to help justify keeping them. Need info on UK mistletoe for 2007/8? Looking for news on mistletoe for winter 2007/8? Well, here we are again. Mistletoe season is upon us once more. And please don’t give me that ‘September is far too early’ stuff – I know what I’m talking about. I’ve just (30 mins ago) been down the Co-op and found a mid-aisle display of ‘Galaxy Mistletoe Kisses’ chocolates. So it really is Mistletoe Season. At least according to Mars Confectionery (and others – see below). My immediate reaction (natch) was to put some in the trolley. Despite the wrapper illustration (not easily seen on this pic) clearly being of plastic mistletoe – which regular mistletoe-blog readers will remember (I hope) that I really really hate. Though I’m currently resisting sampling the chocs (Caroline, the beloved one, is away, and I thought it would make a suitable love-token for her return next week… ) I thought I should check out some reviews. It’s a mixed review – despite the wrapper wording ‘ chocolate pieces with an indulgent mousse & caramel centre’ one comment says they’re just like Galaxy Caramels – but another wants them on sale all year round – reminding me of my old website slogan – Mistletoe is for Life, not just for Christmas. Maybe I should start using it again? Maybe not. ‘TEME’ online mistletoe are chugging along nicely too – lots of enquiries already for this Christmas – some small customers, others rather larger. Lots of weddings too – mistletoe is becoming a fashionable item for winter weddings – symbol of eternal love and all that (not to mention fertility…). 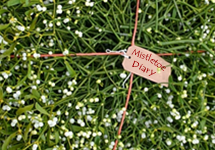 Not just weddings either – there was an enquiry about mistletoe for a funeral this week! Apparently the deceased had met their spouse under mistletoe – and mistletoe has remained a key association ever since.